Queens Park Rangers is the first London club in the English Football League to sign the Armed Forces covenant. The club has pledged to provide a career pathway for veterans and to support club employees who are training or deployed as Reservists. 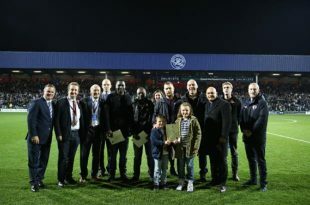 The signing, in February 2017, followed the work that QPR in the Community Trust has been doing to support veterans over the last year, and the R’s have vowed to continue this work skills programme, run with the Royal British Legion, to help veterans prepare for life after the military. QPR has the community at its heart, and a deep respect for those who serve and have served in our Armed Forces. We are delighted to show our commitment to them by signing the Armed Forces covenant. QPR in the Community Trust is the charitable arm of the Football Club and does a lot of outreach work with communities in West London. The Trust uses football and the power of sport, as well as the brand of a professional football club, to engage with people of all ages and offers support with health, education, training and employment. Following some great employability work with local young people, the Trust was granted funding from the Royal British Legion to run a ‘back to work’ programme for veterans in London. This programme combined participation in football with qualifications, life skills training, mentoring and emotional support and networking opportunities with local employers. 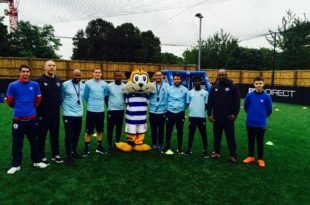 QPR ran a 10 week ‘core training programme’ which included football sessions as well as jobs clubs and mentoring throughout the year for participants. These are still ongoing. Some of the qualifications that are offered include a Level 2 in Customer Service, FA Level 1 coaching qualification and a Money Management qualification. 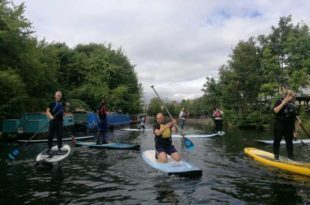 One session also included a paddle boarding networking event with employers from Amazon HQ in London as well as the security firm that run the security for Paddington basin where the event was held. Participants in the programme also came and supported on match days helping to run the fan zone before kick-off and any activities that QPR were running on match days in the stadium. The programme concluded with a celebration event where programme members were invited onto the pitch at half time to receive congratulations from the crowd and certificates from club ambassdor Andy Sinton and the leader of Ealing council, Julian Bell. The Trust has staff that specialise in a range of services as well as football coaching. They provide access for veterans to the Sports and Fitness industry as well as a range of other employment opportunities via local charitable and corporate partners. It is great to see that QPR are signing the Armed Forces Covenant. The success of their employability programme shows how a football club can help service leavers and veterans improve skills and find jobs. I encourage other clubs to support the covenant and ensure all those who serve or have served, and their families, are treated fairly. The signing of the covenant unlocks further grant funding through the Covenant fund which will hopefully allow the programme to become sustainable for the future and enable the club to continue to support veterans into work. You can watch the ‘signing’ by QPR and the then Defence Minister Mark Lancaster on Forces TV (search QPR) or via You Tube. You can also see Employability Officer Jack Kelley talk more about the programme and see some of the veterans the programme has helped. More information is also available on the QPR website.